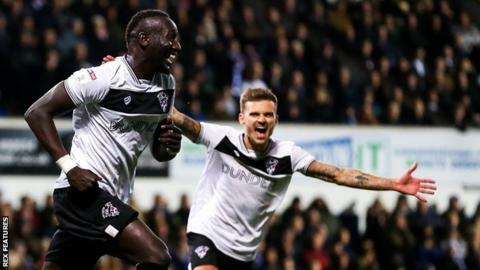 Bristol City twice came from behind to end their four-game losing run with victory over the Championship's bottom side Ipswich Town. The Tractor Boys, who remain six points adrift and are still to win under manager Paul Lambert, went in front through Freddie Sears' low shot across goal. Ipswich goalkeeper Bartosz Bialkowski then diverted Famara Diedhiou's effort into his own net, only for Sears to restore the hosts' lead with another fine strike from the edge of the area. Jamie Paterson's far-post finish made it 2-2 - the third goal of a crazy four-minute spell - before Diedhiou's header completed the turnaround. After a lacklustre first half low on quality, it was Diedhiou's introduction as a half-time substitute that sparked City's revival, with the Senegal striker capping a combative display with his first goal since 24 October. The Robins had mustered just six goals in their past 10 fixtures and looked on course for a fifth successive defeat courtesy of two moments of individual quality from Sears. The former West Ham and Colchester forward has now scored four goals in four games for Ipswich - and he is likely to be key if they are to climb out of relegation trouble. The Suffolk side have not won at Portman Road since 10 April - a run of 12 games - and have only recorded one victory in all competitions this season. "It is massively disappointing for a number of reasons, because we dominated the ball, played really well and scored a really good goal. "The second goal is the one that really annoys me because the team have got to stop crosses and defend better at the back post, those are basic laws of the game. "We have come a long way in a short amount of time, and we are going to get setbacks, and it's how we come back from them. "One thing I won't allow is for the energy levels to drop, we have to bounce back." "It's a fantastic win, we really needed it, and it feels real again because we have worked intensely hard over the past three or four weeks and have got our reward. "It's difficult to come here, with a new manager who has got them going, but we showed brilliant character in a tough game. "I just wanted to see us going for it, with some attacking intent. It was a great day for the club because there is a lot of expectation this season. "We are six points off the play-offs and 14 off bottom. It was a big game to get the monkey off our back and because there is love back in the room." Match ends, Ipswich Town 2, Bristol City 3. Second Half ends, Ipswich Town 2, Bristol City 3. Kayden Jackson (Ipswich Town) is shown the yellow card for a bad foul. Jack Hunt (Bristol City) wins a free kick in the defensive half. Foul by Ellis Harrison (Ipswich Town). Corner, Ipswich Town. Conceded by Adam Webster. Corner, Bristol City. Conceded by Matthew Pennington. Attempt missed. Jamie Paterson (Bristol City) right footed shot from outside the box is close, but misses to the left. Assisted by Joe Morrell. Jamie Paterson (Bristol City) is shown the yellow card. Jack Lankester (Ipswich Town) wins a free kick on the right wing. Foul by Joe Morrell (Bristol City). Attempt saved. Kayden Jackson (Ipswich Town) right footed shot from the centre of the box is saved in the bottom right corner. Substitution, Bristol City. Jack Hunt replaces Eros Pisano. Substitution, Ipswich Town. Jack Lankester replaces Gwion Edwards. Attempt missed. Gwion Edwards (Ipswich Town) left footed shot from the left side of the box misses to the right following a corner. Corner, Ipswich Town. Conceded by Eros Pisano. Flynn Downes (Ipswich Town) wins a free kick in the defensive half. Foul by Jamie Paterson (Bristol City). Substitution, Ipswich Town. Kayden Jackson replaces Jordan Roberts. Goal! Ipswich Town 2, Bristol City 3. Famara Diedhiou (Bristol City) header from very close range to the bottom left corner. Attempt blocked. Lloyd Kelly (Bristol City) left footed shot from outside the box is blocked. Assisted by Adam Webster. Offside, Bristol City. Niki Mäenpää tries a through ball, but Famara Diedhiou is caught offside. Famara Diedhiou (Bristol City) wins a free kick in the defensive half. Corner, Ipswich Town. Conceded by Niki Mäenpää. Gwion Edwards (Ipswich Town) wins a free kick in the attacking half. Foul by Lloyd Kelly (Bristol City). Goal! Ipswich Town 2, Bristol City 2. Jamie Paterson (Bristol City) right footed shot from the centre of the box to the top right corner. Assisted by Niclas Eliasson with a cross. Goal! Ipswich Town 2, Bristol City 1. Freddie Sears (Ipswich Town) right footed shot from outside the box to the bottom left corner. Attempt missed. Cole Skuse (Ipswich Town) right footed shot from outside the box misses to the left. Corner, Ipswich Town. Conceded by Andreas Weimann. Corner, Ipswich Town. Conceded by Tomas Kalas. Own Goal by Bartosz Bialkowski, Ipswich Town. Ipswich Town 1, Bristol City 1. Substitution, Bristol City. Joe Morrell replaces Liam Walsh because of an injury.